Subaru may finally be making a play for all the Greenies that traded in their dilapidated Legacy wagons for a Prius with the G4e EV concept, set to be unveiled at the Tokyo Motor Show. The styling is an odd amalgamation of current Subaru design cues partnered with a Tron-meets-Pichatchu exterior. The wedgified body and short overhangs will do wonders for interior room and flexibility, and with the installation of next-generation, lightweight lithium-ion batteries stowed underneath the floor, Subaru expects that the G4e will be able to motor along for 200 km before plugging in. The G4e Concept is a futuristic environment-friendly concept electric vehicle (EV). packaging which accommodates five passengers, with batteries stored underneath the floor. Â· An image of heading toward the future is expressed by the triangle-shaped body. 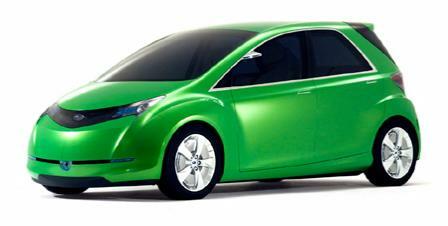 weight, FHI expects this EV to be able to travel 200 kilometers per charge.